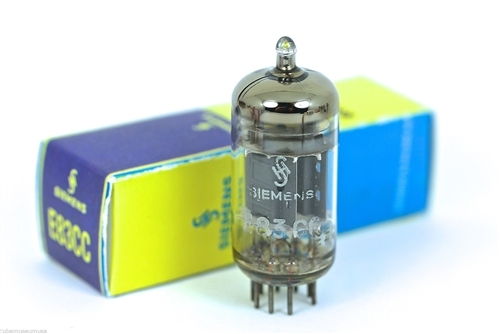 ~ SIEMENS HALSKE E83CC ~ You won't find these VERY RARE triple-mica "microphonic-killer" tubes elsewhere, not these 1960's era HIGH EMISSIONS variety in the Original BLUE & YELLOW box. Much more MAGICAL than the ones in the 1970's-80's newer ORANGE box versions! BALANCED & MATCHED TRIODE 1962 SINGLE TUBE! WEST GERMANY SIEMENS with FACTORY CODE: E0O≠2H = 1966 with TRIPLE-MICA inner construction for low microphonic performance, especially when in an ALL IN ONE combo amp! Great Sounding WEST GERMAN workhorse single tube, reproduces sound with accurate tonality. Superb choice for hifi preamps and Guitar Amps. 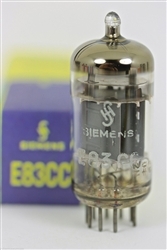 The E83CC Long-Plate Design s a SUPERIOR-CLASS 12AX7 Low-Noise rated long-life tube made to last 10,000 HOURS OR MORE. E83CC is Siemens Halske Munich West Germany's answer to the ECC803S!